There’s no other way to kick off this list than with one of the travel moments that put Turkey on the backpacking map. Thanks to surreal landscapes and flight-friendly weather conditions, Cappadocia is one of the best hot air ballooning locations on the planet. The skies play host to more than a hundred balloons every single day of the year! There are different sized balloons to choose from (from private rides to up to 24 people), starting at about €130 for the standard one-hour flight. The view across the valley as the sun is coming up is one of the most magical things you’ll ever see – Cappadocia is worth the trip for this alone. Claustrophobics, this one may not be for you… Cappadocia boasts 36 underground cities, including the 85-metre-deep Derinkuyu Underground City which could accommodate 20,000 people. This place has got to be seen to be believed! Explore eight floors of cave rooms and tunnelled stairways, complete with meeting rooms, churches and store rooms that date back thousands of years. Oh, and they even have built-in wine presses (priorities, am I right?). No one knows who built the city and when, but it’s thought to have been used as a shelter from foreign invaders. Sleeping in a cave doesn’t sound so fancy, but Cappadocia is here to prove otherwise. Staying in a cave hostel or house is an absolute must-do in this quirky city, and it doesn’t have to cost a bomb either. These dwellings are carved out of the rocky landscape that the city is famous for, and they range from beds in back-to-basic caves to luxury boutiques with expansive views from beautiful terraces. Spend a night, a week, or even just visit one for breakfast. Garden Cave Hostel offers the unique cave stay experience, plus a garden terrace with incredible views over Cappadocia’s unbelievable landscape. The earth can be weird sometimes, and Love Valley is a perfect example of when Mother Nature thinks she’s funny. Home to 40-metre-tall phallic rock formations, this attraction has made a name for itself thanks to erec… sorry, erosion… of volcanic rock. The fairy chimneys were formed from *ahem* eruptions millions of years ago, and nature’s elements have forced them to wear away, leaving only the hardest material to make up a hilarious terrain. If you’re lucky, your hot air balloon might take you for a ride over Love Valley – and it’s pretty cool to see from on top. Okay, that’s enough innuendos for one blog. Whether you’re looking to deck your house out with colourful Turkish rugs, purchase some handmade ceramics, or treat a loved one (or yo’self!) to Sultan-inspired jewellery, shopping in Cappadocia is a nice reprieve from the chaos of Istanbul’s bazaars. Be sure to haggle for lower prices, consider luggage space or shipping costs, and do your research on how to make sure the jewels you’re buying are genuine. Cappadocia’s name actually means “Land of Beautiful Horses” in Hittite, so don’t leave without discovering the crazy landscapes by horseback. Although there are some tour options for first-time riders, most tours require previous riding experience as the terrain can be steep and the Arab and Anatolian horses can be lively. Your tour will take you through volcanic valleys, ancient villages and fruit orchards, and you’ll have a Turkish cowboy as a tour guide. Howdy! If you’re imagining comfy massage chairs, soothing music and a delightful candle scent wafting through a beauty spa, you’ve got the wrong idea. A Turkish bath, or hamam, is a sensory overload, and you can’t visit Cappadocia without trying one for yourself. We won’t spoil the surprise but let’s just say it involves getting nakey nakey nakey (or wearing your swimsuit if you prefer), a dimly-lit room with a sacrificial marble stone in the middle, strong women with sandpaper-like exfoliating gloves, a bubble massage and a dip in a cold pool. Intrigued? One thing’s guaranteed, you’ll sleep fantastically that evening. Rocky mountain ridges, pointy pinnacles and cave churches can be found at Cappadocia’s famous open-air museum, just a short walk from Göreme’s main village. Entrance will set you back 25 lira (about £3.50) and you can pay another 10 lira to get into the most well-known church, the Karanlik Kilise, which houses a number of incredibly bright frescoes (wall paintings) that date back to the 11th century. Be prepared to deal with loads of other travellers – this place is a stop for the tour buses – but it’s worth a good couple of hours of exploring. Cappadocia’s most famous experience is so good that it’s worth mentioning twice. After experiencing sunrise from 3000 feet high, it’s totally worth getting up early another morning to watch the balloons take to the skies while you’re on land. Some hostels have terraces with sweet views across the valley, otherwise there are tonnes of viewing platforms you can get to by car. It’s almost as stunning as being in the balloon yourself… Almost! From questionable rocks and steamy massages to the most epic sunrise you could imagine, Cappadocia is a city full of incredible experiences you just can’t miss. But don’t take our word for it, try it out for yourself on your Turkey adventure! 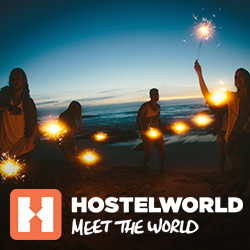 Start planning your trip now – check out all of our hostels in Cappadocia starting from £3!! The post 10 things to do in Cappadocia appeared first on Hostelworld Blog.